Capcom's Final Fight was an arcade sensation for me. The introduction, music and fighting moves on display took it away from the Double Dragons and Renegades of this world and shot the genre way up in my estimation. The CPC version impressed graphically at least , using the massive character sprites and intricate environments well. Lack of sound did upset me, and control was a bit clunky, but it could still boost over the Super Nintendo's port: it had all 3 select-able fighters whereas the SNES only had 2. 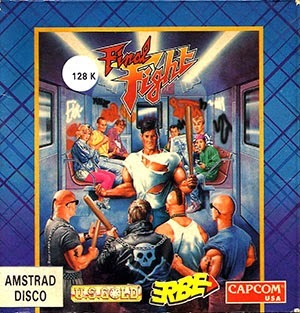 A fine beat 'em up which translated adequately to the faithful 8-bit system when the 16 bits were taking over the world.